The T203 treadmill represents the best that Horizon Fitness has to offer in treadmill technology. It’s their top of the line model and it shows in the T203’s broad range of advanced features and numerous extra touches. It’s an exceptional treadmill that will have you on the road to fitness and better health in no time! The T203 has been replaced by the NEW T303 treadmill, with a updated design and lots of new features. The Horizon Fitness T203 treadmill incorporates Horizon’s revolutionary ComfortSELECT adjustable cushioning system for a supremely comfortable workout that’s easy on your joints and knees. Its fine adjustability allows you to set the amount of cushioning to suit your exact needs leading to a uniquely personalized running experience. Another popular feature of the T203 treadmill is the Nike + iPod functionality. This unique technology allows you to save your workout results to your iPod or iPhone and sync your stats and progress online. It’s a very convenient way to track your progress and can really help you stay motivated from day to day. ComfortSELECT adjustable cushioning system for a superior personalized low-impact running experience. Extra large 20" x 60" running surface perfect for runners with a long stride. Advanced Goal Center allows you to set multiple fitness goals and monitor your progress over time. FeatherLIGHT lift system makes folding the treadmill to save space easy for anyone. Nike + iPod functionality which allows you to save your workout results to your iPod and track your progress online. Widescreen LCD window and two additional small LCD windows to keep you fully informed of stats and progress while working out. Speed range of 0 to 12 MPH. Variable incline range from 0 to 12%. Dock and control your iPod directly from the console. 14 fitness programs ensure a challenge each time you work out. Sonic Surround speakers so you can enjoy music while working out. Dock your iPod and control it from the console. Heavy duty 2.75 CHP motor designed for long life and quiet operation. Lifetime warranty on frame and motor, and 2 year warranty on parts. For workout tracking the T203 treadmill incorporates Horizon’s Advanced Goal Center. This advanced computer allows you to set your time, distance, and calorie-burning goals, and then monitor your progress daily, weekly, or monthly. It’s a great way to stay motivated and reach your goals more quickly. The console also allows you to monitor your heart rate with the included hand grips. And if space is a consideration you’ll love the T203 treadmill because it also features Horizon Fitness’ FeatherLIGHT lift system. FeatherLIGHT lets you fold up the treadmill with almost no effort at all. When you’re finished working out simply fold the treadmill with just a touch to save valuable floor space. The T203 also allows iPod owners to use them for more than just storing workout stats. You can also dock your iPod and control it directly from the treadmill’s console. The T203 also includes the Sonic Surround speaker system so you can listen to your favorite music while working out. The T203 treadmill incorporates Horizon’s most powerful treadmill motor. It’s a commercial-grade 2.75 CHP motor that’s designed for ultra quiet operation at all speeds. The Horizon Fitness T203 treadmill incorporates all of the top features and technology that Horizon Fitness has to offer. 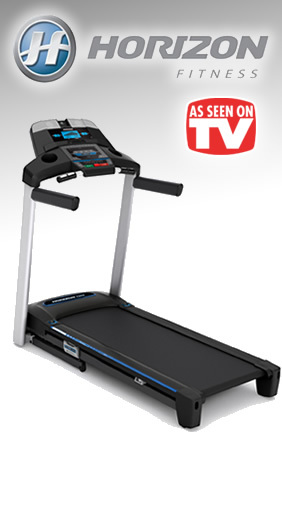 It’s a superior product and it leaves lesser treadmills in its dust. What are you waiting for? Try it out for 30 days and we’ll bet that you’ll completely agree!